Lightweight AccuMold Elite gear revolutionizes the concept of duty gear, crossing the boundaries between leather and nylon holsters and accessories. Up to 50% lighter and more affordable, but with the same crisp professional appearance of premium leather. Exhibits a high level of resistance to the daily knocks, scuffs and abrasions of duty use. Less work to maintain that "inspection day" look! Easily cleaned with only mild soap and water. Washing with disinfectant soap or bleach solution will handle contamination problems, great for correctional institution duty. Bianchi makes the transition from conventional duty leather to a synthetic duty gear an easy decision. Belts are 2" (50mm) oversized to accommodate liner belt and padding. Specify exact waist size when ordering. Really great quality belt Really brings out the uniform, people gave me a lot of compliments. Doesn't feel as stiff as I wanted and have had previously with what I thought was the same belt. The lightest, strongest belt Ive had. All my coworkers ask me where I got it and it seems Ive started a new belt trend Perfect gun belt. Very comfortable sitting in the car or walking around for hours at a time. Highly recommend this belt. Impressed with quality. Seems well built and does the job I needed it for. Love this belt. Very comfortable and high quality. Good, just tough to put stuff on. Very comfortable, wish I would have purchased one years ago. Great belt that is very stiff and wears well. Highly recommended. Works and fits like a charm. Pro's: Fantastic duty belt light weight and professional looking. Con's: I don't love the tri-release buckle that came with this belt, I prefer the other style that comes with Bianchi's belts. Also Bianchi could take note from the rigs that competitive shooters use and reverse the current hook and loop setup with the outer belt containing the hooks and the inner belt containing the loops. This setup is better when you have taken your outer belt off. Bottom Line: Aside form my nitpicking this belt is excellent and you will not be disappointed. Bianchi Accumold Elite belts and accessories are the best duty gear I have ever owned. The only leather duty belt with a plastic or metal buckle that I know of on the market. Fits securely. I do recommend the inner belt. the buckle locks securely. Much easier to put on and take off than a traditional duty belt. Stays in place and very easy to adjust fit. Great duty belt but the only issue I had was the belt buckle, it wasn't as strong as I needed it to be. Very nice. One thing I would say is unless you wear below 32 waist get the medium. Small fits but not a lot of room to go. Nice polished look and comfortable. 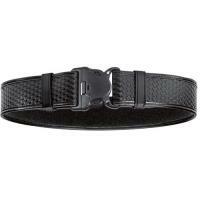 Good quality, light weight, I ordered a size larger then my waist size and the belt works great. Get relaxed fit, very sturdy. If my normal waist size in jeans is a 31 or 32 I got the small inner duty belt. Do recommend getting a size bigger in the outer duty belt? The Small size accommodates 28-34, so it should be the right size for you.